Citation Information: J Clin Invest. 2006;116(1):70-79. https://doi.org/10.1172/JCI25445. 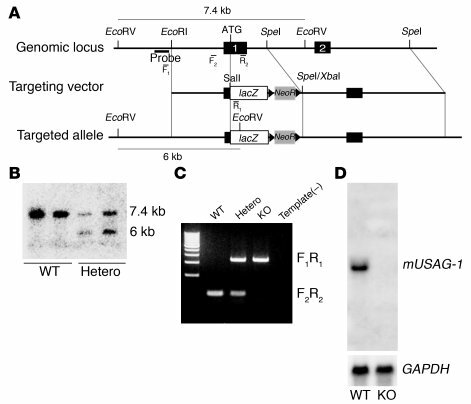 Generation of USAG1–/– mutation by gene targeting. (A) USAG1–null allele was generated by homologous recombination in ES cells. Exon 1 (black box) and part of the intron were replaced with a lacZ gene (white box) and the NeoR cassette (gray box). (B) Analysis of USAG1+/+ (WT) and correctly targeted heterozygous (Hetero) ES cell clones by Southern blot analysis using 5′ genomic probe (thick black line in A). (C) PCR genotyping of F2 littermates. Template(–) is the negative control. (D) Northern blot analysis of USAG1 mRNA in the kidney of USAG1+/+ and USAG1–/– (KO) mice.